Watching Durham Bulls Baseball: House of Durham Victorious! 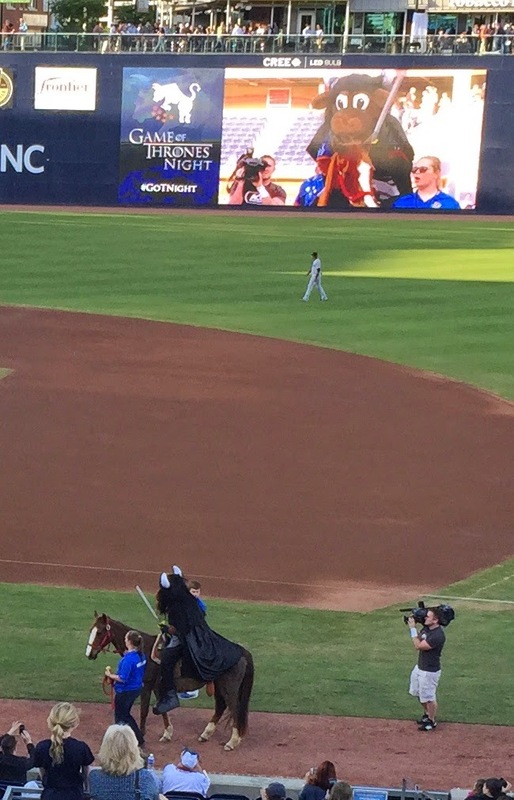 Wool E. Bull rode in on a horse and everyone had a great time to the sound of Game of Thrones music. A terrific GoT-themed video (see below) played a couple of times and every ballplayer was given a GoT-themed image for his at-bat. Good idea, hope the auction went well. Meanwhile there was a lot to like and a lot that was worrisome about the game. Likes included Scott Diamond’s start and Andrew Bellatti’s first appearance as a reliever (he’s had two starts so far this year). I’m just guessing, but possibly Alex Colome’s rehab start allowed the Bulls to move Bellatti into the role he was hired for. Likes also included a walk, two singles, a RBI, and decent 3B play by Leonardo Reginatto in his first AAA game; a breakout game at bat by Curt Casali with 3 singles, a walk and an RBI (more about that RBI later); and a home run by Alexi Casilla. Worrisome aspects were the 14 men left on base; yet more errors leading to unearned runs; DH J.P. Arencibia’s 4 K’s; and the fact that only one of the first 24 batters got the ball out of the infield. But we would not be doing our job if we didn’t point out the oddity of the game that led to the first Bulls score. Vince Belnome got to first base when Charlotte pitcher Erik Johnson botched a routine toss to 1B. He moved to 2B on a walk handed out to Joey Butler. After J.P. Arencibia K’d for the second out, Johnson got to a 3-2 count on Curt Casali. So the runners were going. Groans from our part of the stands as he hit a sky-high popup over the middle of the infield. Suddenly we were visited by a flashback to our little league days as the ball landed in the dead center of the pitcher’s mound with the pitcher, shortstop and first baseman all staring at as it rolled off. Meanwhile Belnome trotted on home. Mikie Mahtook called up to the Rays (sigh). Bulls are one short at the moment. He did not play last night. The Rays have twelve players on some sort of disabled list, but that doesn’t count the four on the Bulls roster also on a disabled list. At least I don’t think it does. My blogging colleague over at Noise Nation (KramsKorner) who follows the Lehigh Valley IronPigs (Phillies), has put up a cautionary post I commend to all of you. Fortunately, no one reading this blog is likely to need the caution. None of us ever turn our backs to the game when someone’s at bat, do we? Meanwhile, here’s the very cool Game of Thrones video that won’t mean a thing if you’ve never seen the show, but nice music anyhow. Re: the link, that's scary. We've seen a lot of folks take one in the head over the years, and I admit we've gotten careless there in 208. Thanks for the reminder.